You don't see the transparency effect if there's nothing below the layer because there's nothing there for Photoshop to calculate (all these blend modes involve calculations based on the values of the corresponding pixels on each layer), so it just shows you the image. In this particular case (as Farray pointed out while I was writing this! 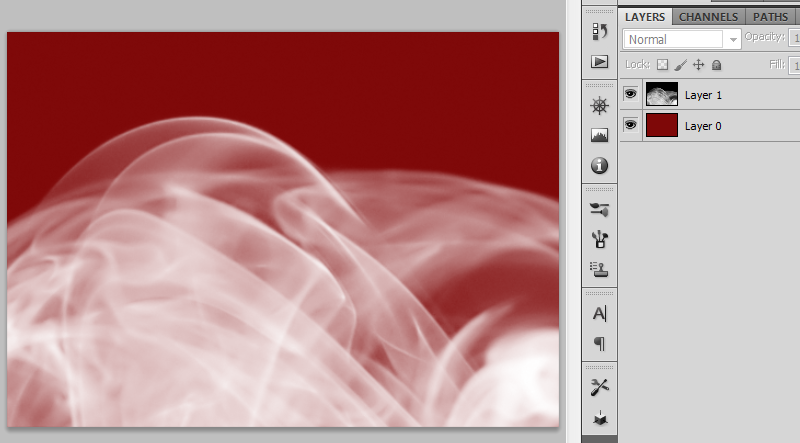 ), you can pull an easy trick on Photoshop and make yourself a smoke-filled image with all the transparency intact. It's easy because you already have gray smoke on black, just like a channel. Here's what you start with: I've taken a "smoke on black" image (Layer 1) and applied it in Screen mode over an arbitrary background (Layer 0). Step 1. Hide all layers but the smoke. Step 2. Switch to the Channels Palette and Ctrl-Click (Cmd-Click on Mac) on any of the channel thumbnails ("any" because in this case they're all the same). What you've just done is load a selection based on the grayscale values in the channel you chose. Just like a mask, white is fully selected (opaque) and black is fully unselected (transparent), with the gray shades between. Step 3. Create a new, blank layer, set your foreground color to white, and fill the selection. Hide all the other layers. Step 4. Deselect, turn on your original background, admire the result, and move on to greater things! Farray's suggestion is very similar. Do steps 1 and 2 then use your selection to create a mask. The advantage of this approach is that you can then and "tweak" the mask in the Masks panel. Welcome to Graphic Design. 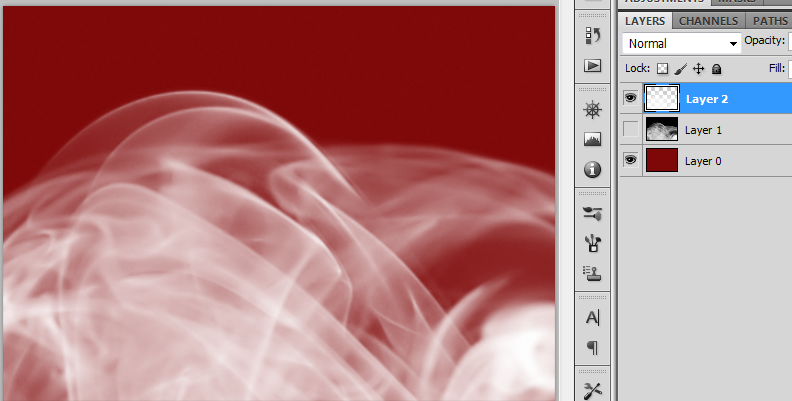 If the smoke doesn't have any colors in it, you could use the smoke image to create a layer mask on a white layer. This would change the blending to simple alpha channel instead of doing blending that is dependent on lower-layer pixels. I had a similar question a while back trying to extract clouds this worked extremely well for me you might find this useful. Alan Gilbertson's answer worked well for a single-color image, but I needed to go through this process for a full-color image on a black background. The PS action reviewed at http://www.howtogeek.com/59634/remove-backgrounds-automatically-with-a-free-photoshop-action/ (Author's download page here) ended up working beautifully. Not the answer you're looking for? Browse other questions tagged adobe-photoshop transparency background-removal or ask your own question. What is the easiest way to make the background transparent in this image? How can I color all layers below without coloring over transparent background? “Multiplying” a white background gives perfect results! how do I save this image? Colour Overlay is tinting white background, how do I make it apply just to black pixels?